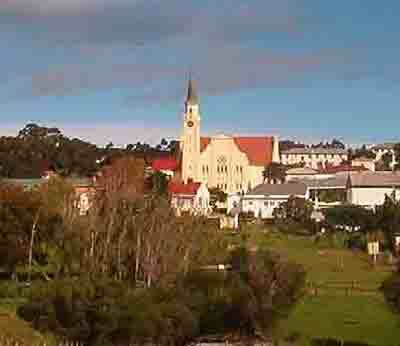 Bredasdorp is a country town about two hours drive from Cape Town along the N2 and the R316 highways. Built on a 368 metre hill called the Preekstoel (pulpit) Bredasdorp looks out over farms where sheep graze and wheat grows. Nothing much happens in the town and life carries on as in most other country towns throughout South Africa. This week however the Cape had its first winter storm and all hell was let loose on this small town and its surrounding areas. Rain fell in the mountains above the town and swept down the mountainside flooding the whole area. Bredasdorp and Napier were cut off from the outside world by water as bridges were washed away and peoples' houses were flooded. According to news reports the Sunday floods were the worst since 1941. Luckily the weather changed for the better on Monday and helicopters were able to fly in to see the damage and start some relief work in the area. Water that flooded Bredasdorp has moved out of the village now and has flooded the low plains to the south where it is still rising as the runoff from the mountains continues. Villagers living in the the low lying areas around Bredasdorp have suffered the most. Their low cost houses were flooded, some walls were cracked as the chest high water flowed through the town. The aftermath of the storm and resultant flood has left the area covered in mud. Peoples' belongings such as mattresses, double beds, kitchen dressers, TVs and toiletries can be seen lying about in the drying mud. Where people could rescue their clothing they have done so. Black garbage bags are being used to keep them dry while houses are dried out and the mud cleaned off the floors and walls. It will take some time for the towns of Bredasdorp and Napier to get back to normal. Today, almost a week after the floods there are still areas that are unreachable by road . Lack of road communication resulted in a death today (Thursday) when an old lady who required hospitalisation could not be rescued. Part of the N2 highway between Caledon and Riviersonderend has collapsed and the the two towns have been cut off from one another. This causes a major problem as the main highway to the east is now blocked and motorists will have to find alternate routes to get to Mossel Bay and other cities such as Port Elizabeth further east. With all the roadworks taking place in and around Cape Town there are very few roads which at present can handle their full load of traffic. This blockage will add further stress to an already overloaded system of roads in the Western Cape. The country towns of Bredasdorp and Napier have some interesting history. Because of a dispute between Michiel van Breda and his neighbour, P V van der Byl, both built churches on their farms. The result was that two different towns eventually came into being. The grand old church built on the farm Zoetendals Vallei belonging to Michiel van Breda remains at the heart of modern Bredasdorp and today forms part of an excellent museum complex. van Breda who in 1838 became the first mayor of Cape Town farmed with merino sheep and is regarded by many to be the father of the merino sheep industry in Bredasdorp and the Cape. The Agulhas coastline which is a short way from Bredasdorp is the final resting place of many shipwrecks. Furniture salvaged from them is displayed in a shipwreck museum established in the town. As there is so much more to see in the town and surrounding areas why not take a weekend off and base yourself in Bredasdorp and explore the towns and coastline for yourself. You never know what property bargain or antique you might find hiding away in the countryside just waiting for you to come along and rescue it. Just give them some time to recover from the floods before visiting them.